This morning, I had the pleasure of sitting in, via telephone, on a conversation about the biggest tax changes affecting military families and veterans. The primary speaker was LTC David Dulaney, Executive Director of the Armed Forces Tax Council. 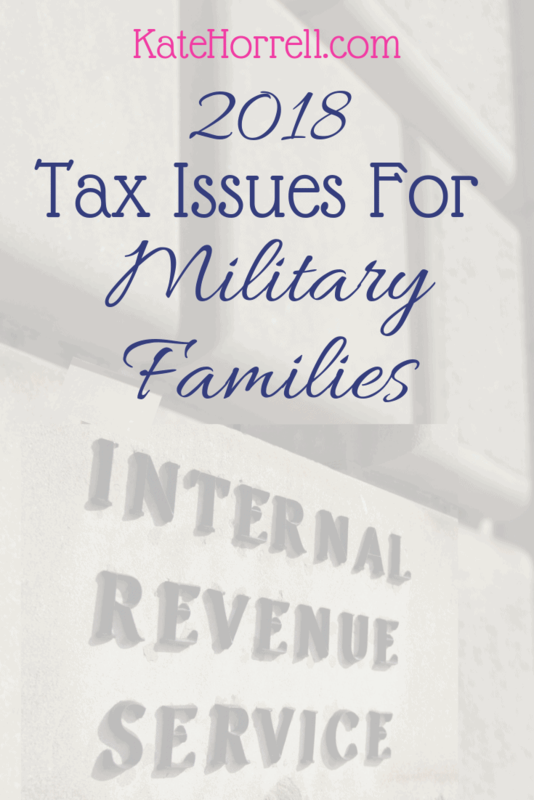 The Armed Forces Tax Council advises the Department of Defense (DoD) on taxes issues that affect military families, and brainstorms to make the tax process easier on military families. LTC Dulaney identified several major changes that will impact military families this year. For many families, this will be the biggest substantive change this year. The Veterans Benefits and Transition Act of 2018 permits spouses to use the service member’s state of legal residence for filing state and local taxes. There have been many, many questions about this change. LTC Dulaney shared that while his office doesn’t know yet what the states will require as far as documentation, he expects it will be simply through filing a tax return. The Tax Cut and Jobs Act of 2017 eliminated the deduction of unreimbursed employee expenses. This includes the rare case where a service member could legitimately deduct uniform costs, or other expenses, including travel expenses for reservists who travel less than 100 miles to drill. However, the deduction for reservists who travel more than 100 miles to drill remains intact. This year, the Armed Forces Tax Council worked with the IRS to streamline the tax filing extension process for individuals who are deployed, but not covered by the special rules for deployments to an area designated Combat Zone Tax Exempt (CZTE.) Under the new rules, the legal office of a deployed unit can do a single request for all the members of the unit. This provides an extension of time to file, until 15 December, but does not extend the time to pay. If you expect to owe, you would need to go ahead and make that payment before the filing deadline. Members of the armed forces are still allowed to deduct unreimbursed moving expenses if the move was in conjunction with a Permanent Change of Station (PCS.) LTC Dulaney recommends that taxpayers read IRS Publication 3 to familiarize themselves with the rules for unreimbursed moving expenses. Service in the Sinai Peninsula is now CZTE effective 9 June 2015. Service members who have been in the Sinai Peninsula can request a corrected W-2 from DFAS, and file an amended tax return. There is a 3 year window to file amended returns. so service members who served in the Sinai Peninsula in 2015 need to get that amended return done quickly. In a law that was passed in 2016, Congress identified that over 133,000 veterans had taxes incorrectly withheld from certain disability severance payments. This year, the DoD identified these veterans and worked with the IRS to send out a notice explaining the situation and how to file an amended return or apply for a standard amount. The letter came out in the June/July time frame and laid out a one year window to apply for the standard payment or file an amended tax return. LTC Dulaney encouraged service members to utilize the two income tax preparation programs supported by the DoD: The Volunteer Income Tax Assistance program and the Military OneSource MilTax program. The VITA program provides trained volunteers to provide face-to-face income tax return preparation assistance. These specialists are trained in military-specific tax issues including combat zone benefits and the Earned Income Tax Credit. Military families can find a VITA location using the VITA locator at Military OneSource. The Military OneSource MilTax program provides online income tax preparation service and online tax advice. Military families can file one federal return and up to three state tax returns, totally free of charge. This service is available to active duty, National Guard, reserves, immediate family members, plus 1 year post-separation. It’s shaping up to be an interesting tax year. I look forward to seeing how all this year’s changes impact our military families.